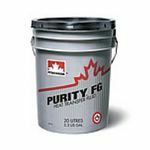 As a Suncor Energy business, Petro Canada produces some of the purest base oils in the world – 99.9% pure. Their world-class refinery in Mississauga, Ontario, Canada (just outside of Toronto) has an annual capacity of over a billion litres. 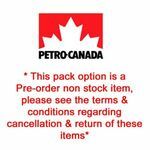 Petro Canada is also the world's largest producer of pharmaceutical white oils. 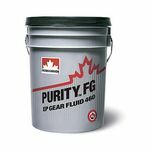 With over 350 premium quality lubricants, specialty fluids and greases, they're in business to keep your business running smoothly. 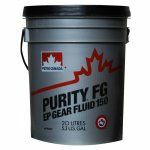 Petro Canada's PURITY™ food-grade lubricants are designed for many applications in food processing plants. 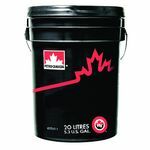 Petro-Canada PEERLESS™ greases are premium performance, multi-application greases formulated to reduce operating costs and provide extended protection in high temperature or wet operating conditions. Petro-Canada Duratac Chain Oils are formulated specifically for lubricating the chains, guide bars, journal bearings and sprockets of modern high-speed chain saws. Duratac Oils are an economical, tacky, “once through” line of lubricants. 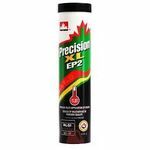 They are formulated to reduce dripping and “throw-off” by their adhesive and stringy nature. 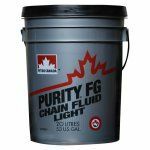 In addition, Petro-Canada Duratac Chain Oils may be used for general machine lubrication where a tacky, non-drip oil is required, or where water wash-off of the lubricant is aproblem.